In keeping with the Society’s aims of promoting the understanding and research of plumeria, we have established an educational outreach fund to support academic scientific research on plumerias as well as to educate prospective landscapers and designers about the beauty and ease of plumeria in the landscape. In order to meet its educational outreach goals, the Society relies on donations from its members and the general public. 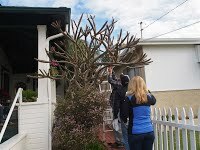 If you have plumeria trees that need trimming, the Society has experienced members standing by ready to assist. All cuttings will be donated to the SCPS, which will sell the cuttings. All proceeds will go to the SCPS educational outreach fund. Please email us at treetrimming@socalplumeriasociety.com if you’re interested in having trees trimmed. NOTE: Orange County residents should feel free to contact our sister organization, the South Coast Plumeria Society, to ask about their tree-trimming services.